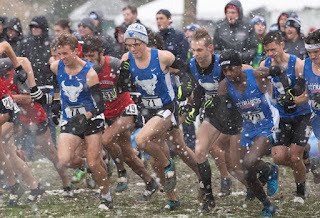 BUFFALO, N.Y. -- Playing host to the NCAA Northeast Regional Cross Country Championships on Friday in a snowy afternoon at the Audubon golf course, the University at Buffalo men's cross country team took home a top-ten place finish while placing two athletes on the USTFCCCA All-Northeast Regional team. 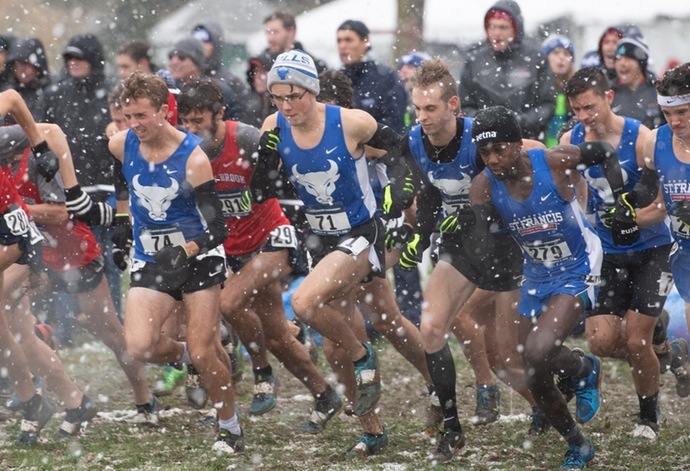 The UB men claimed 7th place out of a field of 34 teams with 245 points Friday afternoon in the 10k event, placing just ahead of Columbia and Stony Brook. The Bulls were led by none other than first team All-MAC runner Caleb Covell. Covell, a two-time MAC Runner of The Week selection, crossed the line in 20th with a time of 33:3.4. Right on his heels, crossing the line in 21st, was junior William Hilbert, the second team All-MAC selection, with a time of 33:36.8. Both upperclassmen were awarded with USTFCCCA All-Northeast Regional honors as they finished in the top 25 out of a very competitive field of 241 runners. Also preforming well for the bulls was sophomore Oscar Vazquez who clocked in a time of 34:23.2, good for a 55th place finish. Freshman Cal Puskar closed out his successful freshman campaign ad her crossed the line in 63rd with a time of 34:29.1. Justin Van Epps closed out the top 100 for the Bulls with an 86th place finish. Collecting the Northeast Regional victory in the men's 10k event was Syracuse University with a team score of 79. The Orange ousted second place Iona, who collected 88 team points. Individually, Paul Hogan claimed victory in the event for UMass Lowell with an impressive time of 32:30.9. For the UB women, senior Lauren Reyda crossed the line first for the Bulls in the women's 6k event as she collected a 73rd place finish in a time of 23:19.5. Crossing the line next for Buffalo was junior Chardae Henry with a time of 24:20.9 (148th), and junior Brittany Fuller, clocking in a time of 24:24.3 (154th). Heavy favorites Columbia were able to take home the Regional tittle as the Lions collected first place with a team score of 41, besting IVY League opponents Dartmouth and Yale who came in second and third place respectively. Collecting the individual victory in the women's 6k event was senior Shannon Malone from Syracuse.